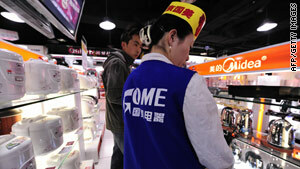 Huang built Gome into one of China's largest retail chains. Beijing, China (CNN) -- Huang Guangyu, once China's richest man, was sentenced Tuesday to 14 years in prison, state media reported. Huang -- the head of Gome, one of China's leading retail chains -- was charged with stock-market manipulation, insider trading and bribery. The sentence, handed down Tuesday, also fines Huang 600 million yuan ($87.8 million) and confiscates property worth 200 million yuan ($29.2 million), said the Xinhua news agency. The 41-year-old Huang went on trial in late April. He emerged as a rags-to-riches entrepreneur in the late 1980s, when young Chinese pursued business ideas and turned them into multi-million dollar ventures. Born to a poor family in southern Guangdong province, he moved to Beijing in his late teens and, with a capital of 30,000 yuan ($4,391), set up with his brother a home appliances distribution company. He founded Gome Electrical Appliances Holding in 1987 and built it into a flourishing retail chain. Huang ranked first on Hurun's China Rich List, a local publication, in 2008 with an estimated fortune worth $6.3 billion. Such a top ranking is usually not celebrated in China because of the scrutiny it brings. Huang typically kept a low profile despite his wealth and influence. His meteoric rise has captured the popular imagination in and outside China. He also inspired many aspiring Chinese entrepreneurs. Police detained Huang in November 2008 for an investigation into suspected "economic crimes." Little was heard of him or of the investigation, but the police dragnet gradually grew wider, ensnaring government and police officials in charge of fighting financial crimes. Huang resigned from Gome's company board in January 2009. In February, after 15 months in custody, Huang was formally charged.